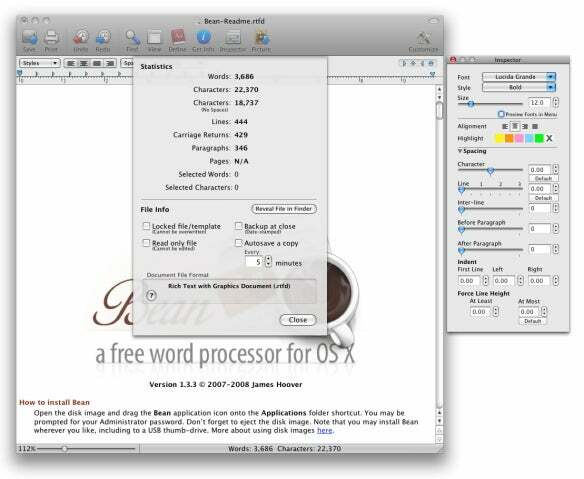 To my eyes, Bean’s interface is cleaner and more accessible than TextEdit’s. But it’s the additional features that really make Bean unique. When writing, Bean gives you live-updated word and character counts, and a Get Info button provides useful statistics about the current document, including the number of lines, carriage returns, paragraphs, and pages; you can also select text to see the number of words and characters in the selection. And in addition to standard find/replace features, Bean lets you select text by font (style, family, size, or color), highlight color, ruler, or combinations of these attributes, making it easy to reformat matching sections of a document. Bean also makes it simple to match selected text to other parts of your document, and provides a few clever editing commands, such as Invert Selection. Bean also offers a number of useful viewing options. You get live zoom resizing using a simple slider; a page-layout mode; and a full-screen editing mode. Among my favorite features is one-click access to an alternate-color mode for better visibility in low-light situations; the default scheme is white text on a dark-blue background, but you can choose your own colors. Bean can also display invisible characters, and a floating-window mode forces Bean’s windows to float above other programs even when Bean isn’t the frontmost program. Bean’s Inspector palette provides easier access to features such as highlighting and spacing than TextEdit’s various palettes and windows. While testing Bean, I also appreciated the auto-save feature and an option to automatically save date-stamped backup versions of my documents. And Bean includes an excellent Help system. The developer also offers a Multilingual Edition that’s localized for Catalan, Chinese, French, German, Japanese, Korean, Slovak, and Swedish. Of course, Bean isn’t a full-featured word processor; it’s missing such features as footnotes, document links, hierarchical styles, and change tracking. And TextEdit still beats it in a few niche areas such as font kerning. But for most people, it’s a good middle ground between TextEdit and something like Pages or Word. Bean 1.3.3 requires Mac OS X 10.4 or later.